Why Multi-Stage Compressor More Efficient Than A Single Stage Compressor? The main reason for high efficiency of multi-stage compressor is the presence of intercooler. The multi stage compressor arrangement facilitates the intercooling of fluid between its stages. The intercooler may be water cooled or air cooled. It reduces the temperature of fluid to compress. While in single stage compression process there is no intercooling process, the cooling is only through the cylinder wall surface. This type of cooling is less efficient compared to intercooling. During compression process, large amount of heat is produced. 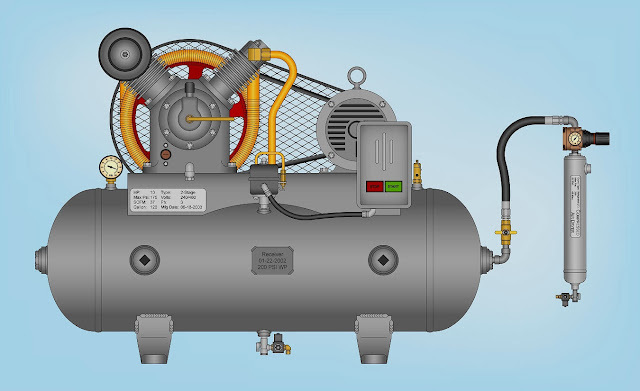 In multi-stage compressor, we can cool down the fluid between each stage. The work done increases with absolute temperature. So the compression at a lower temperature is more thermodynamically efficient. If some process required hot compressed fluid, then it is better to keep fluid cool by interstage cooling, then heat the fluid at the last stage.